It feels like I've been working on this kit for a long time! I don't think I'll be doing a full paint job on another Real Grade kit, it makes the pieces hard to assemble because the fit is very snug. I've broken several pieces from painting and handling. I don't honk these kits we're meant to be fully painted, it feels like Bandai intended for them to be assembled as-is and then detailed a bit. Anyway, I'm happy with how it's turning out for the most part! This kit has been my first paint job with lacquers and also my first airbrushed kit. There are some spots where I didn't mix the paint properly and it bubbled up when I sprayed it; I touched those areas up but some still show through. They're not perfect but I don't think it detracts from how the kit looks overall. Next up will be some more touch up (especially the right ankle where I spilled some copper and scraped the gray getting it off). The copper is Mr Metal Color which is meant to be painted, buffed to a shine and then left alone. It comes off very easily; all you have to do is make contact with your finger and it rubs off, so I'll be waiting until just before I top coat to retouch those areas. After that, decals panel line and top coat! Enjoy some photos :) Also, stay tuned as I'll be announcing this sites first contest, and an awesome prize, a FREE GUNPLA KIT!!!!! I used a fluorescent red enamel for the mono eye, it really pops! Look at that red eye! Gotta redo the pink piece on the crotch here, paint is uneven and the piece doesn't sit correctly. 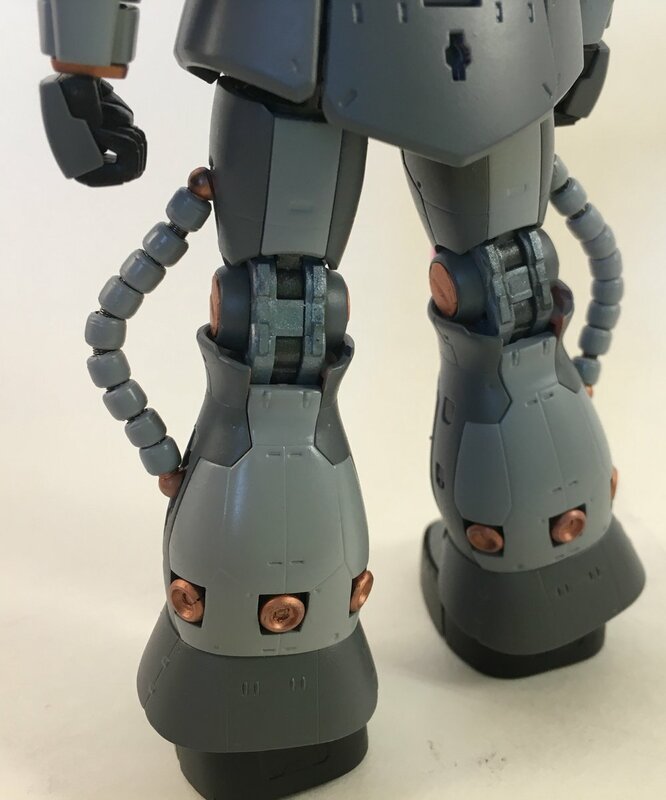 This is my favorite area of the kit (back of the legs). I love the way they are designed, good detail lines and the color separation of the parts is well done. Until next time, keep building! And don't forget to come back for my contest. Unless you don't like free stuff. Actually, go ahead and come back even if you don't like free stuff!